Archibald Primary School has now completed a three year partnership with the Royal Shakespeare Company. Three members of staff have achieved a Post Graduate Certificate in the Advanced Teaching of Shakespeare. Archibald Primary was successful in becoming a Hub-school for the RSC and led a cluster of six other schools in exciting projects over the last few years. The cluster have attended training looking at active approaches to learning; they have performed ‘A Midsummer Night’s Dream’ in hidden areas of Archibald School and, for their final year, performed the History plays ( Henry IV Part One and Two and Henry V). We are also very pleased to announce that two pupils from each of the cluster schools will be performing on the RSC stage in Stratford in July 2015. This partnership between the Middlesbrough schools will now be extended into future work with the RSC. Twelve schools are now signed up to work with us on our next project celebrating 'A Midsummer Night’s Dream'. For the last three years, the Staff at Archibald Primary School have attended training using active approaches and have shown great enthusiasm for the Shakespeare projects we have developed in school. In 2014 the whole school (Reception to Year 6) performed 'The Tempest' as a theme for Special week. Staff stated they would like to repeat the activity for Special Week 2015 and the school performed 'Henry IV Part One'. It was amazing to see all the pupils involved and enjoying the plays. Each Year Group from Reception to Year 6 now has a Shakespeare unit of work and use active approaches to engage their pupils. The staff also extended their use of active approaches when commemorating the anniversary of 'World War One'. The pupils engaged with World War One poems using the same strategies we use for our work on Shakespeare's plays. One highlight of the last three years that has to be noted is the invitation to meet His Royal Highness, Prince Charles. 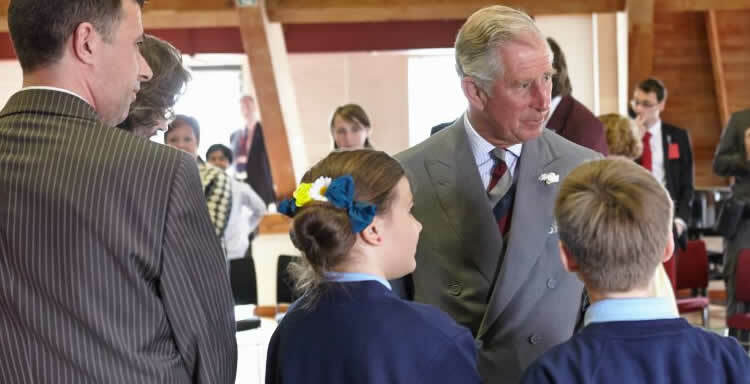 The RSC School Co-ordinator and two Year 5 pupils travelled to Stratford to meet Prince Charles. This was a very special moment that will never be forgotten. What is PiXL Primary Edge? The Primary Edge is an exciting opportunity for pupils to develop key skills through a variety of activities. We want our pupils to record the ways they help others, work together and support each other as they work towards their Contender Award. This will give pupils an award which runs alongside their academic successes and recognises what they can do as well as what they know. Please click here to learn more about the LORIC family! We are very excited to have been one of five pilot schools for PiXL Primary Edge in 2015, prior to its national launch in September 2015. Our pupils featured in The Primary Edge promotional video shown at the National PiXL Conference held in September 2015 at The Oval in London. Four pupils attended the conference to represent Archibald. They answered questions from members of the conference audience and show-cased some of the work in their log books. Before heading home they had a tour of The Oval Cricket Ground and a short sightseeing tour of London.